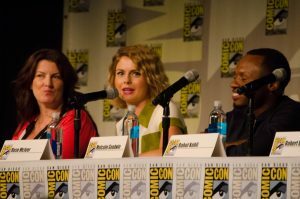 On July 25-26, 2014, Rose McIver attended her very first convention during the ‘San Diego Comic-Con‘. For the promotion of the new CW’s show ‘iZombie‘, she went there with her new colleagues to promote the show. This was the first opportunity for fans of the show to meet the actors and attend the signing. The panel have been the opportunity for fans to ask any questions they wanted about the new show of The CW. Remember that during this Comic-Con, the show was not yet on the air & was to be released only several months after the convention. Below, find all the exclusive information from actors and producers. 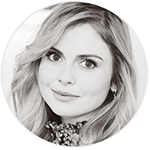 – Like, Rose McIver’s voice even sounds like Kristen Bell. – Such a Veronica Mars vibe front the extended trailer. Love it! – Liv is psychic ish. – No pilot screening today due to recasting. Reshoots going on in the next three days. 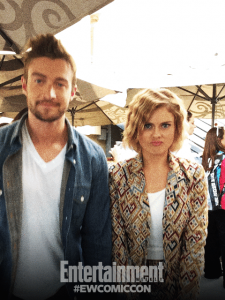 – Exclusive look at #iZombie was absolutely brilliant! Buffy mixed with #VeronicaMars and Hard Bodies. Excited for the season! – Rose likes the tone of the show and is excited about it. – Rose says playing a zombie is fun, playing a med student is hard. – Rose nailed the auditioned for the part. – Producers felt they were getting a hit it once they got Rose. 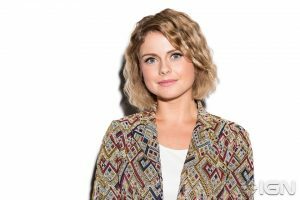 – Rose McIver was the 100th actress to audition. – When Liv eats brains she also picks up the dead persons talents. – The brains don’t completely overtake Liv. 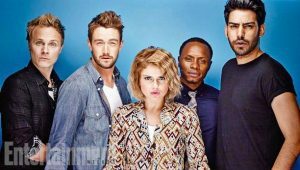 – #iZombie closer to Buffy the Vampire Slayer than to Veronica Mars. – I’m getting a pool! We have a hit. — Diane Ruggiero on finding Rose McIver. – Not just brain solving mystery of the week. In #iZombie will be a big zombie plot line. – When Liv gets hungry her makeup gets darker. – When she eats a new brain remnants of then old brain is out of her system and no longer takes over. – Bad Zombies will make more zombies and it’s super easy to make more zombies. – Liv can’t control when she turns into a full zombie. – Liv solving murders brings meaning to her life. A classic of the SDCC, is to go on the Warner Bros Boat. Here is the photos they took there. Here is the full list of videos interviews available from SDCC. First you can see the panel, then the red carpet interviews and to finish the press room interviews.